MagicalButter’s executive chef has found that the highest grade of cannabutter begins with clarified butter, resulting in a smoother consistency and enhanced flavor. What exactly is clarifying, and what’s the best way to go about it? The result of taking this extra step is a smoother consistency and enhanced flavor. But some may be wondering, What exactly is clarifying, and what’s the best way to go about it? Clarifying is removing unwanted milk solids from butter. The preferred method is very easy to do on a stovetop or hot plate. Simply warm the butter in a saucepan over low heat without stirring. As it melts, it will separate into three layers: a thick layer of beautiful, clear, golden butterfat (this is our clarified butter), sandwiched between two layers of white milk solids. The solids take the form of fluffy white foam floating on the surface and denser clumps that will collect, along with water, at the bottom. It is these white milk solids that so readily burn when sautéing in regular butter. 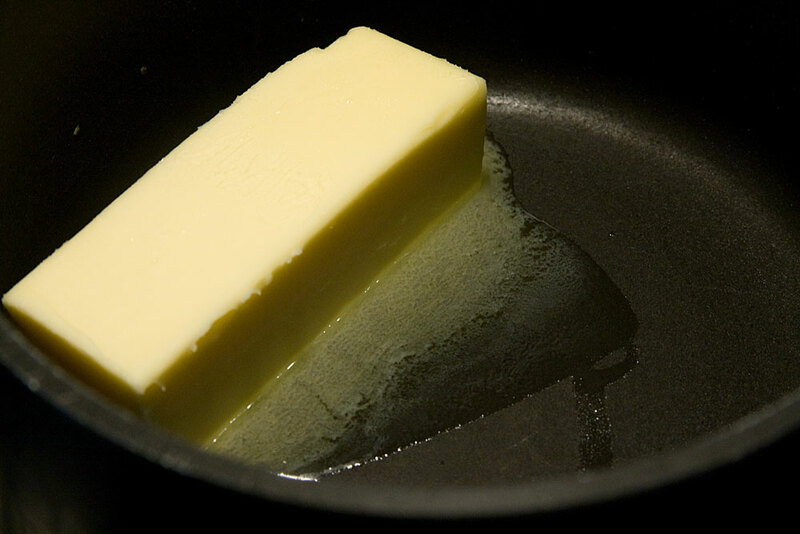 Using clarified butter is better because it solves that problem and makes pan frying more fun. Once all the butter has melted, use a spatula to skim off and discard the white surface foam. Then, gently decant the golden clarified butter into a glass vessel, leaving the clumpy white milk solids and water in the bottom of the saucepan. Clarifying reduces the volume of butter by about 20 percent; e.g., if you start with six sticks, after clarifying you will have about four and a half to five. Now that you have your golden clarified butter, it’s time to herbally transform it! Into the MB pitcher it goes, along with your choice of herb. If using cannabis, prior decarboxylation is important (any kind is fine, but THE kind is better for the mind!) Adding a tablespoon of lecithin per cup of butter is highly recommended, as lecithin helps the phytonutrients in cannabis bind to the butterfat. Set the temperature and push the Butter button, and that’s it! Time to put on your favorite sounds, relax, and enjoy the psychedelic light show while the Botanical Extractor™ does all the work. In two hours when your MagicalButter is ready, simply pour it into the included PurifyFilter™ bag, wearing the LoveGlove™ to protect the hand holding the filter from the hot contents of the pitcher. The filter captures all the plant remnants and sediment, leaving a wonderfully rich and aromatic herbal infused butter. For tons of other great recipes and information about the unique MagicalButter® system, visit MagicalButter.com.